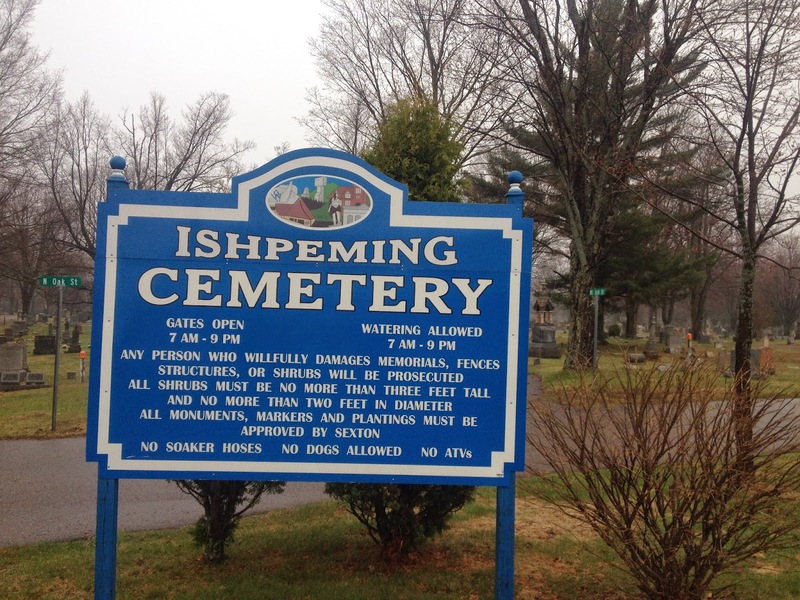 We planned to spend the day in Ishpeming so we could visit some of my Dad's relatives and see more of the area. We started the day off by checking out the maritime museum and lighthouse in Marquette. Sadly the museum and lighthouse were not open for the season so we didn't get inside but we had a chance to walk around and see it from the outside. This is a lighthouse that they have saved for tours and the history of the town. The morning started out raining but it went away and turned out to be a nice day. 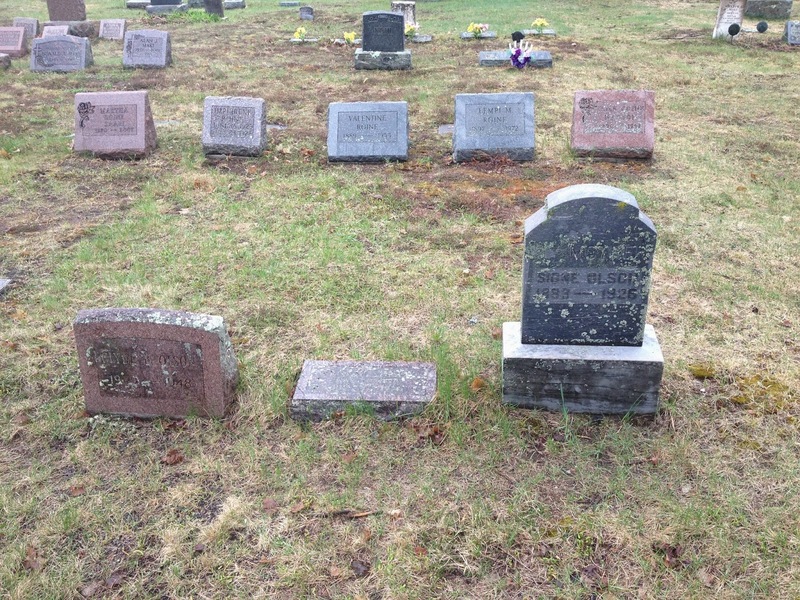 We then went to visit some relatives graves in the Ishpeming Cemetery. We had to search for quite awhile to find them but after getting their plots and the map figured out we found them. This is my Dads uncle and grand parents. 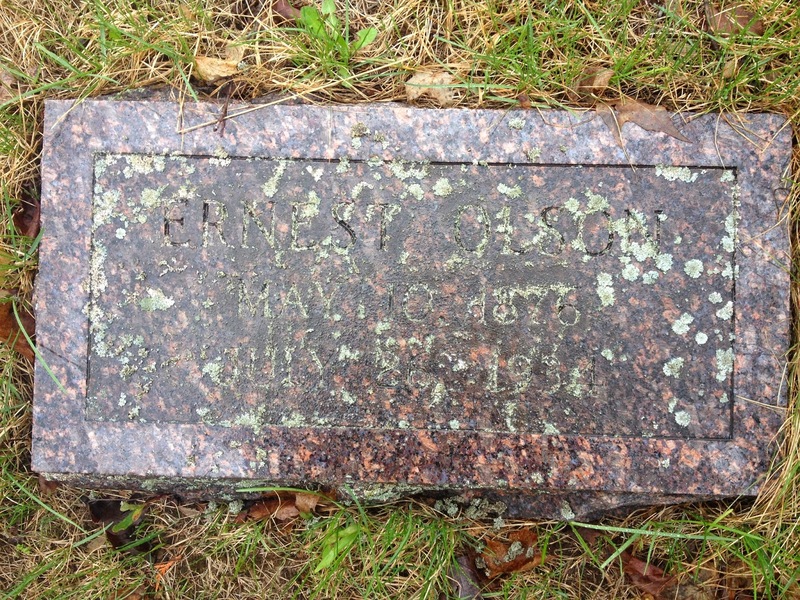 When my Dad had visited 22 years ago he had found that his grandfather didn't have a headstone. 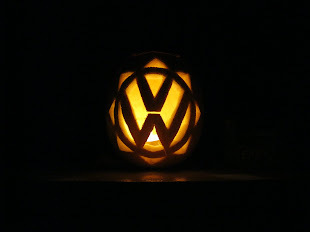 When he got home from that trip he had one made and placed on his grave. This is the headstone. 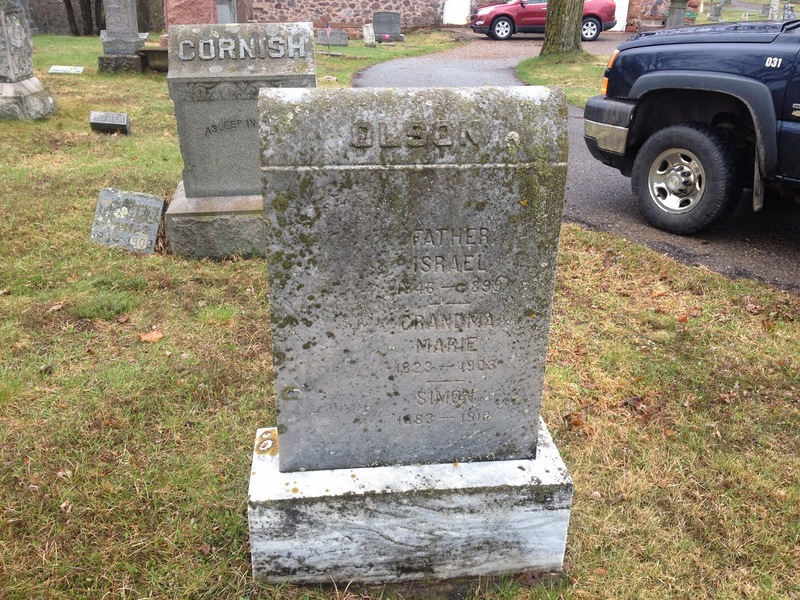 We then searched the other side of the cemetery and found my Dad's great grandparents grave. This is it. We spent at least an hour or more searching for these graves but it was worth it in the end. I don't have a lot of family on my Dad's side buried in Utah so it was good to see these ones and know where some of my relatives are buried. 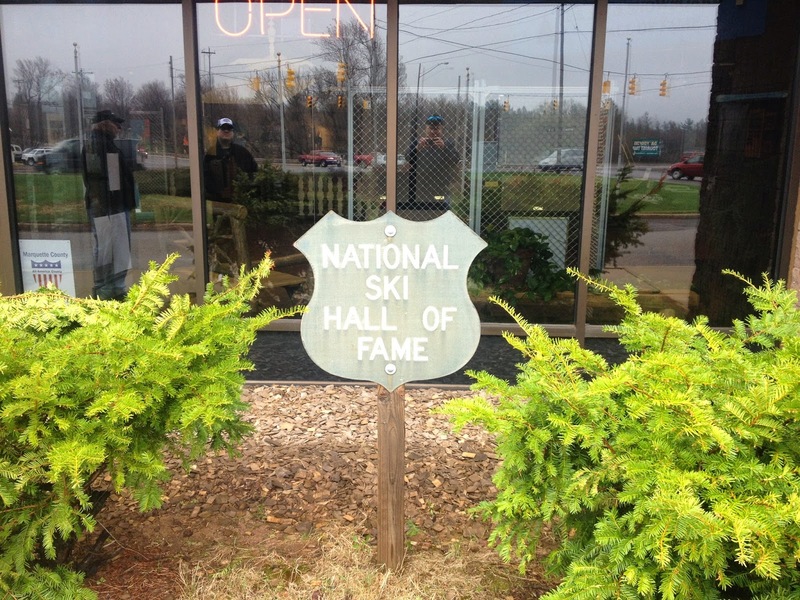 From there we went to visit the national ski hall of fame that is located in Ishpeming. This society was started in Ishpeming and they induct new people every year into it. We watched a short movie on the history of skiing and then were able to see some history of skiing that they had there. 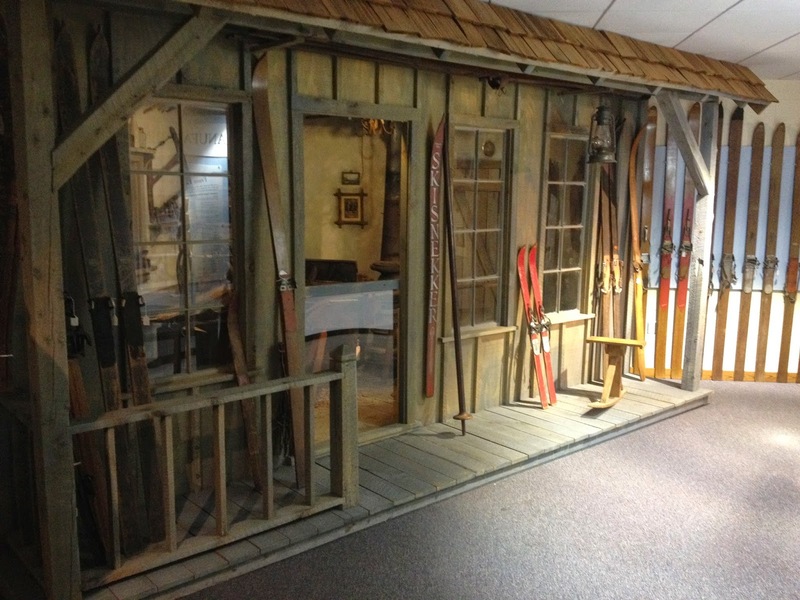 This was a mock up of how an old ski shop would of looked like in the early days. 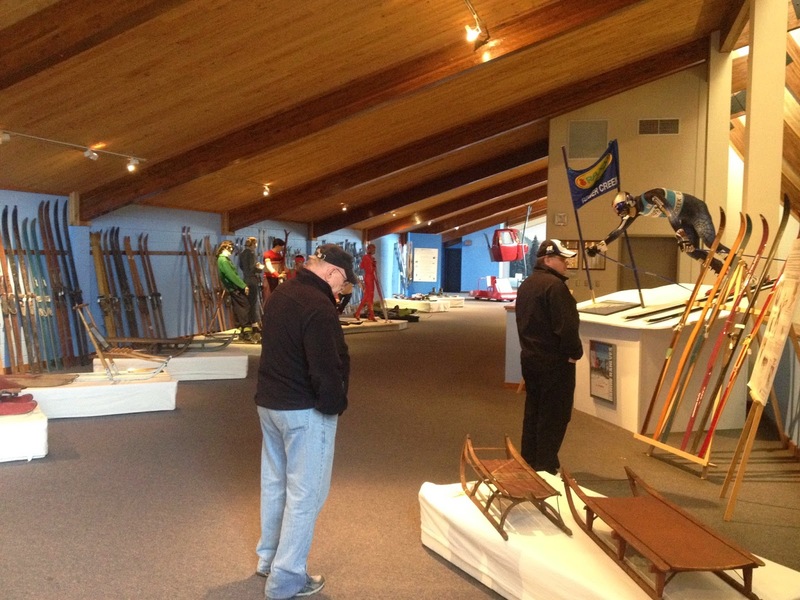 They had a ton of skis from all time periods. It was really interesting and amazing to see how things changed over time. If you live in the Upper Peninsula then you know all about pasties. They are pronounced "Pass-Tee's" They have a meat and potato filling wrapped in a sort of pie dough. They are a staple up here and we went to the best place in town to get one. I have to say it was really really good. This is what they look like. Everyone eats them with ketchup here. They are good and filling and the price is very cheap. If you find yourself in the UP, you must try a pasty. 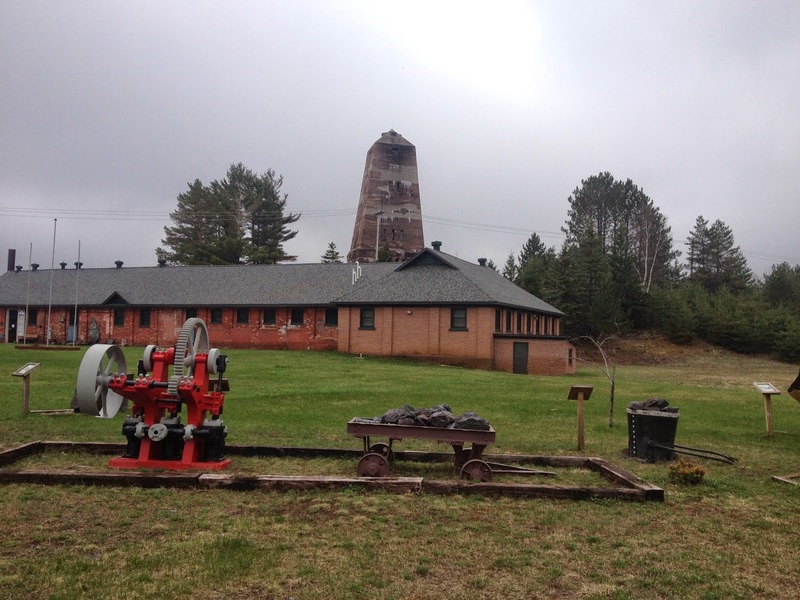 Ishpeming is a big mining town. This is an old mine shaft tower that is in the middle of town. There are 2 of these old ones and a newer one in town. The red building is a mine museum but like the lighthouse, it was not open for the season yet. We are about a week too early for everything to open up. 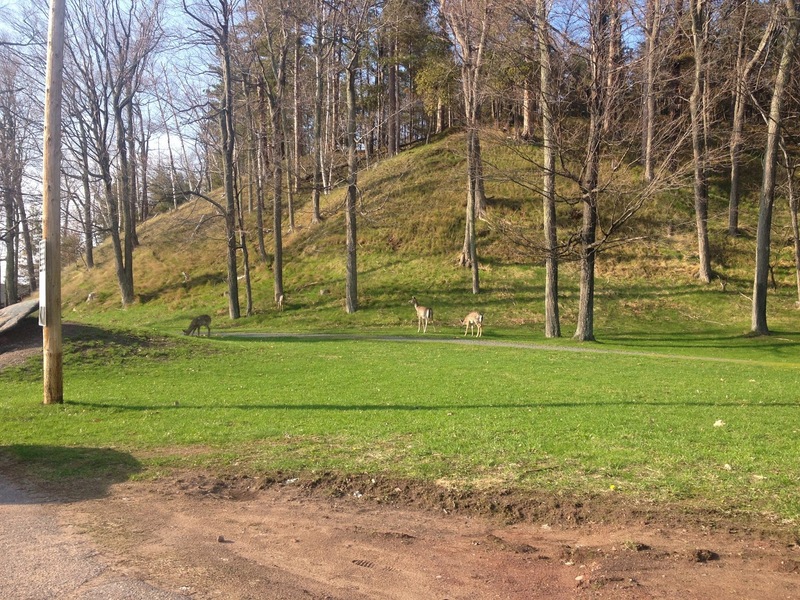 They are just barely coming out of winter here so most things don't open until the first part of June. They did have lots of cool stuff to look at outside though. 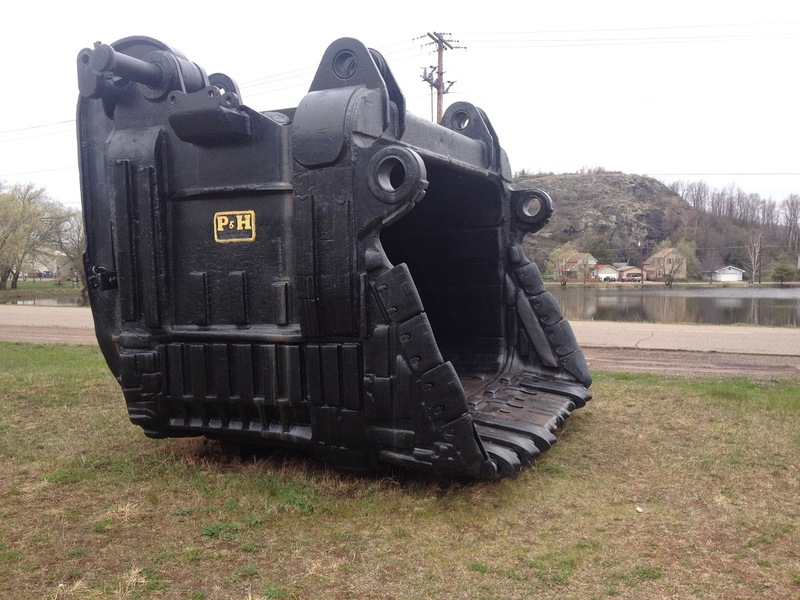 This is one of the old shovels that they used in the mine. I could stand inside it and not bump my head. It was about a foot thick also. This thing must weigh a bunch. We visited my Dad's cousin last night and she told us of the big joke in Ishpeming. I guess a company came to town and wanted to install a windmill. 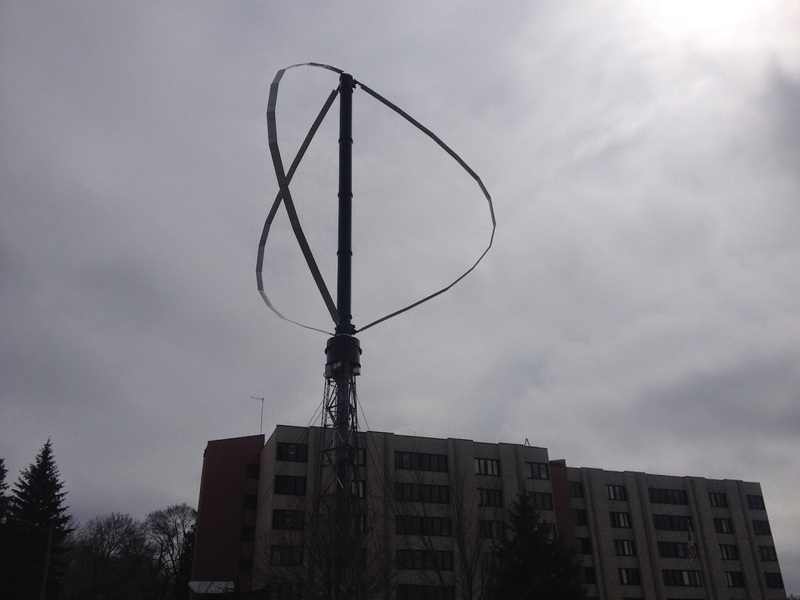 It was a high tech new type of windmill and they wanted to install it in Ishpeming. They said it wouldn't cost a dime to the city and so they let them put it in. They installed it and were going to test it out. I guess about the whole town showed up to see this thing and so they let it go and all the blades (which the locals say were made out of tin foil) collapsed and fell off. The company said they were going to fix it and this is how it sits today. It's still not working and it looks kind of funny. When we drove into town I asked my Dad if that thing was some kind of modern art. He said he didn't know but it looked like it was. Ha Ha, I guess we know now. All the locals laugh about it and it has become the joke of the town. We spent some time visiting more of my Dad's relatives and then checking out the little lakes that are spread throughout the area. 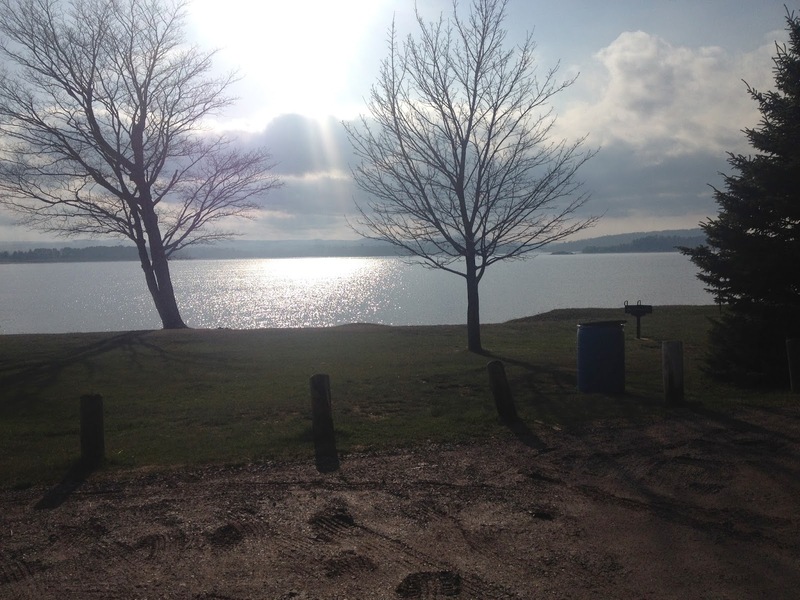 Everyone has what they call a camp on a lake around here. They are really quite nice and I think someone could live there if they wanted to. I didn't get any pictures of them but I should of. 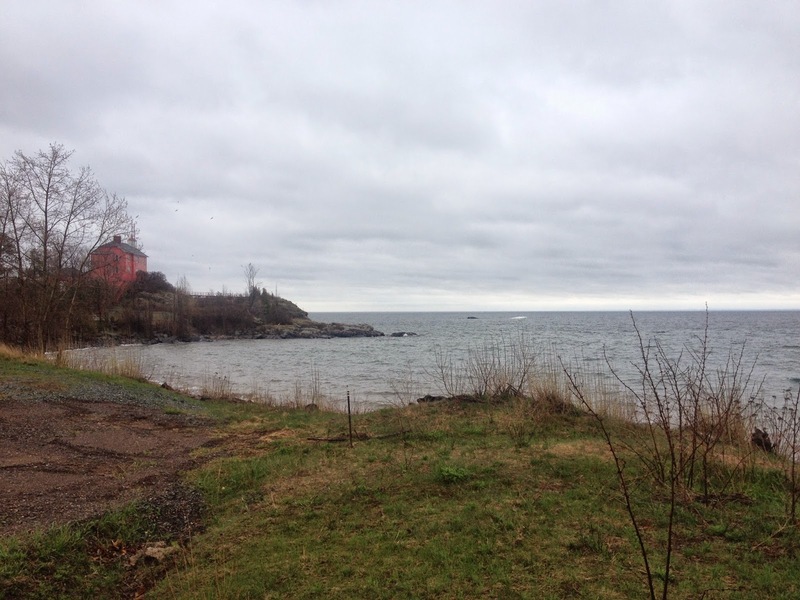 We went back down to lake superior and they were loading an ore boat while we were there. 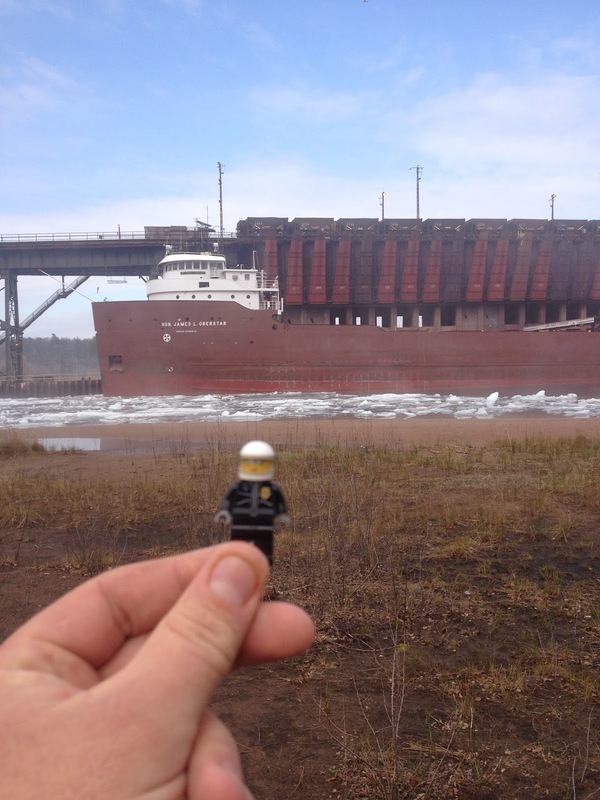 I had to get a picture of lego man by the ore boat for my son. Here is a panoramic picture of the boat. Notice the ice in the water. The fog kept rolling in and out as we were there also. This picture was taken just after they finished loading the ore. They have huge chutes that come down and fill the different compartments in the boat. It was neat to see and the noise of the ore pellets dropping down the chutes into the boat was impressive. I have seen more deer up here then I have ever seen. They are everywhere. That's how we ended the day today watching the sun drop over lake superior. Tomorrow we will be back on the road. We are going to head over to sault ste marie tomorrow and see the soo locks. 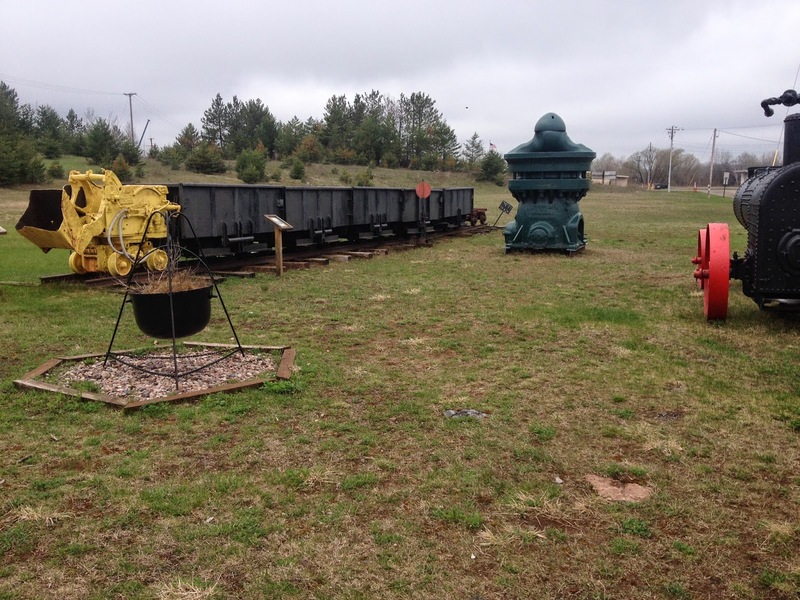 I am sure we will see more ore boats along the way. Hopefully we will see one go through the locks while we are there. Check back and see what is going through the locks when we are there.